Thor sounds just as good as its bigger sibling, and its ability to share patches makes it a fantastic tool for portable sound design. Ability to share patches with its Reason counterpart. Flexible and great sounding. Well designed interface. Some controls are a little fiddly. Thor's keyboard concept is borrowed from Figure. The iPad port of Thor makes no compromises in terms of depth or flexibility. 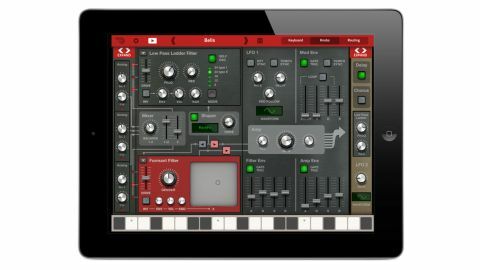 With Thor for iPad, Propellerhead Software brings Reason's flagship synth device to iOS. This is Propellerhead's third mobile music making venture, following a flawed but likeable port of the company's classic ReBirth package, and Figure - an iOS-specific synth that was brilliantly designed but lacked the depth and flexibility of a 'serious' music making tool. In essence, Thor for iPad features the exact same synth engine and control options as its Reason counterpart. In the app these are spread across three UI windows: Keyboard, Knobs and Routing. The Knobs screen controls the bulk of the actual synth engine. Just as with the Reason version, there are three oscillator slots, each of which can be filled with one of the synth's six (fairly self-explanatory) oscillator types: Analog, Wavetable, Phase Modulation, FM Pair, Multi Oscillator or Noise. These can then be routed in various ways through the synth's three filter slots - which can each contain Low Pass, State Variable, Comb or Formant filters - and the Shaper and Amp sections. There are two LFOs and Filter, Amp and Global envelopes to control everything and, finally, global Delay and Chorus effects to add finishing touches. Layout wise, everything here looks near enough identical to the original, except for the fact that sections of the interface are collapsible in order to fit onto the iPad's screen. The Routing screen, meanwhile, is pretty much a straight duplication of the bottom part of the original Thor's UI. Along the bottom there's a 16-step sequencer, while the routing matrix above features 13 slots allowing users to modulate pretty much any part of the synth via any other part. The Keyboard screen is the only section that looks noticeably different from the Reason version of Thor. Here we find a collapsible touchscreen keyboard - which is roughly based on interface tricks Propellerhead have learned with Figure - which can be shaped around a selected musical key, minimizing the likelihood of bum notes caused by clumsy fingers playing a cramped virtual keyboard. The keyboard can be expanded over several octaves, and there are Latch, Strum and Hit modes allowing chords to be played in a variety of different ways. There are virtual pitch and mod wheels along the left hand side too, while the same polyphony, portamento and assignable rotary controls you'll find in the original Thor occupy the top part of the screen. Additionally, to compensate for the relative fiddliness of working on a touchscreen, each knob, rotary and fader provides detail numerical feedback when touched. There's also a miniature version of the keyboard that runs along the bottom of the interface, so patches can be auditioned in each window. Thor is a powerful and impressive-sounding synth, and has been one of the highlights of Reason since it was introduced in version four. The iPad incarnation is no different in terms of quality; it sounds just as good and - unlike Figure - the iOS port doesn't compromise the depth of control. It's in its flexibility that Thor has always been most impressive, however. There are a multitude of sound design options available thanks to the variety of oscillator, routing and modulation options - none of which have been lost in the port to iPad. What's more, just as with its bigger sibling, Thor's clear and intuitive layout makes it a very approachable instrument, even for those with only a rough grasp of how synthesis works. For non-Reason users it's a cheap way to get your hands on one of the DAW's best devices. Admittedly, it's not the same of having a plugin version of the synth but, combined with an iPad compatible MIDI controller and/or interface, it's certainly a decent addition to your production arsenal at a relatively small price. Thor for iPad's real edge, however, lies in the fact that it can share patches bi-directionally with its bigger sibling. As a result, for existing Reason users the app really comes alive as a tool for portable sound design. It allows users to invent or fine tune patches on the go, and then easily add them into projects in Reason later on. By doing so, Thor turns the concept of an iPad synth from a mere novelty into something genuinely useful to electronic musicians. While it gives Thor an edge over the majority other iOS apps for the time being, it's a trend we'd hope will catch on. We'd love to see more of this from both Propellerhead (the Kong Drum Designer would make a great app) and other synth developers. For the time being though, Thor is easily one of the finest instruments we've seen for the iOS platform, and potentially an invaluable tool for portable sound design.